Unfortunately for owners of apartments builtfor small projects, kitchens in these houses have a particularly small dimensions. Practically insoluble problem, for 6-7 square meters to place not only the necessary household appliances and furniture, but also to create a comfortable environment for cooking and eating. 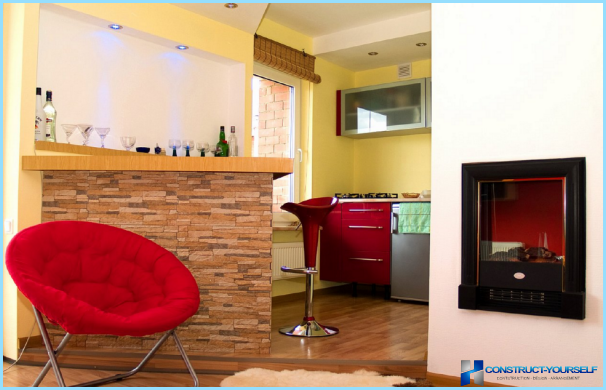 As one of the solutions to the problem - to combine the space of kitchen and living room together. 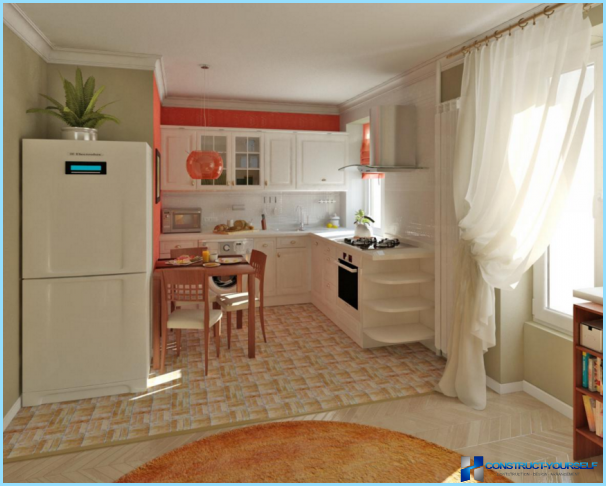 Combining the kitchen with living in a small apartment,You can get quite a large room, which is at the competent planning, placement of furniture and decoration will be very convenient, comfortable and practical place to live. The main thing in such a project to avoid mistakes in planning and consider all the pros and cons of a combined kitchen and living room. The only way to avoid disappointment and get the maximum benefit from the perfect event. It generated a lot of extra space for meetings large companies. The process of cooking takes place, without interrupting communication with loved ones. it is impossible to retire. 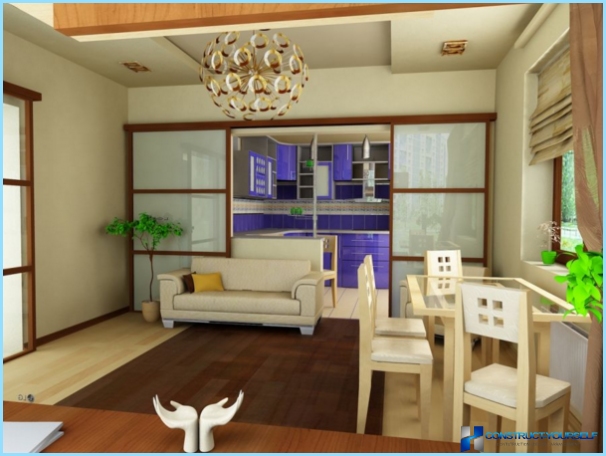 If you have a studio apartment, this layout includes a living area, bedroom and kitchen. Even if the family consists of two people, the feeling that you are sleeping in the kitchen, will haunt you forever. window sizes and the amount of light they let in the house. Color scheme of the walls for the combined kitchen withliving room should be a single. 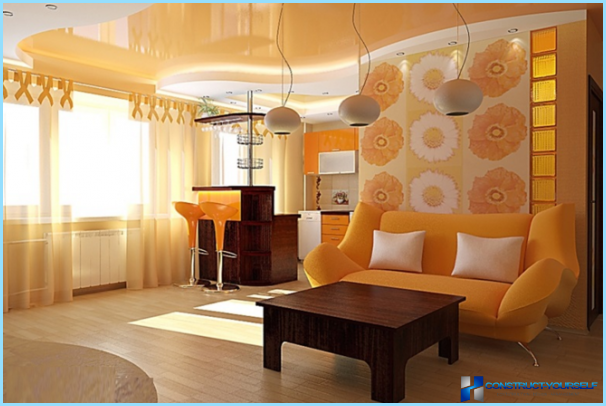 If you want a contrast to the interior, the colors may be from the same colors, but different in tone. Do not use very bright, saturated colors, taak they will conceal and so is not very large space. Attention! Wanting to add brightness to the interior, you can use these shades in small details. And always remember that the brighter part, the smaller size it should be. 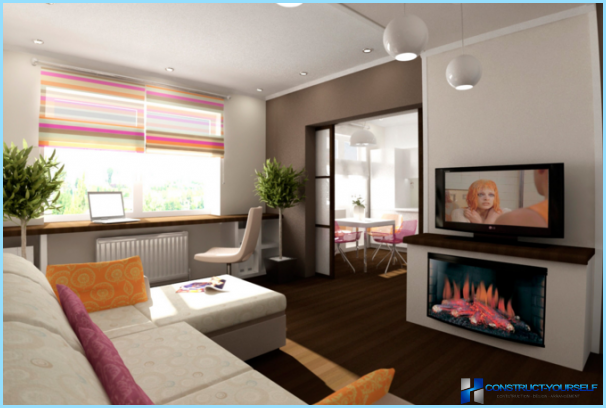 Very stylish and fresh looking interiorcombined kitchen and living room, in plain, neutral and very light shades. For example, a delicate beige color allows you to create the room a feeling of comfort, warmth and coziness. One of the latest trends in contemporary design interior is sustained only natural natural colors, with brown and black color can be used only in case of a very good light. 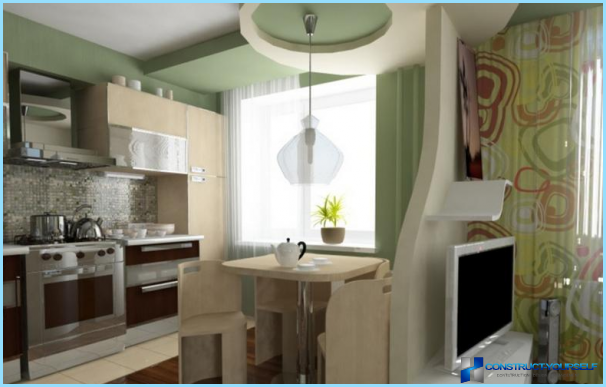 The main task facing the hostshousing - this is the correct positioning of all the necessary items for life in the kitchen combined with living room. Thus it is necessary to find a method that will not only accommodate, but also easy to keep in order all that, why can not refuse. Due to a fairly small area, this problem can become quite serious. have a high quality workmanship and excellent indicators of water resistance and resistance to mechanical stress. Each item in the kitchen combined with living roomIt must be in harmony with each other and maintain a single selected style. It is not necessary to install newfangled cuisine of metal and glass, if the seating area is decorated in a classic style. For built-in appliances good optionIt becomes their installation for furniture facades. This not only saves storage space, but also to maintain a balance and harmonious perception of the same territory. Council! Positioning furniture and other items in the kitchen combined with living room, it is necessary so that they could not really convenient to use, but also had good access for cleaning. Once demolished the wall between the living room and kitchenIt formed quite a large area, which must be zoned correctly. That's a very difficult question. To avoid errors in the layout, you can contact the experts. Wanting to save money to pay forLabour designers should carefully consider themselves united by the subtleties of zoning spaces and create a plan of the premises, which will take into account all your wishes and subtleties of the house construction. Even in the absence of the walls should be clearlyadhere to the differentiation into functional zones. Kitchen for cooking, a living room for relaxing and entertaining. Forming a unified space plan should clearly distinguish between these two areas, and to help you with this are a few tips. cooking zone can be limited by using light. 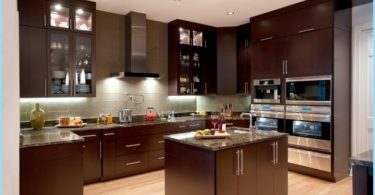 To do this, in the living area, one ceiling mounted fixture, and the kitchen is illuminated by a variety of built-in LED lamps. After separating the demolished wall on itsWhere can I install a small bar. Thus, it formed not only additional space for a meal, but also visually divides the space combined kitchen with a living room. The rack should not necessarily be long and high enough small design size, which will play a very important role in the delineation of the room. 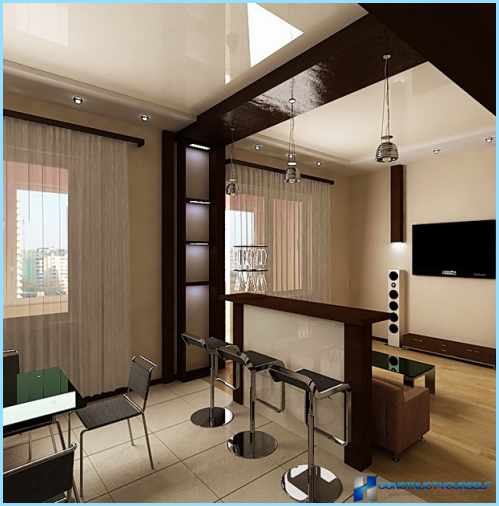 In addition to bar zoned premises, on a fairly small area it can become: a dining table, sitting area, comfortable seating for meetings with friends. The bar, equipped with a variety of shelves, can be a good showcase for dear to your heart of things. Thus, it combines the two functions are practical and decorative. No matter how strange it looked, but after the demolitionwalls, you can set the screen light doors. But this should be done in a convenient place for you. Lightweight design allows at any time to allocate for the combined territory of a nook in which to hide from prying eyes. Attention! This approach to planning is highly relevant if the kitchen is not a good drawing. It can prevent the entry of foreign odors in the living area of ​​the apartment. Doors - screens can be easily ordered atcustom tailored to companies that specialize in the manufacture of lightweight aluminum construction. The richness of colors and textures used in the production of materials to create a door that will closely match the design of your apartment. 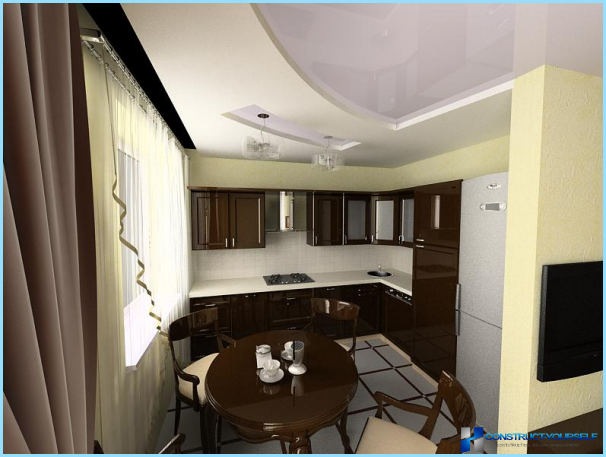 Common kitchen and living area in a smallapartment can be visually divided into zones using the set of the podium. This is a fairly time-consuming process and requires a certain cost, but on the result obtained is very stylish and unusual design of the room. An additional advantage of this method of zoning - it is an opportunity to apply the built-in lights. They can become not only a good additional lighting, but also an original decorative element. When selecting mounting the podium, you can use the fill method, or to build a structure made of plywood and metal profiles. 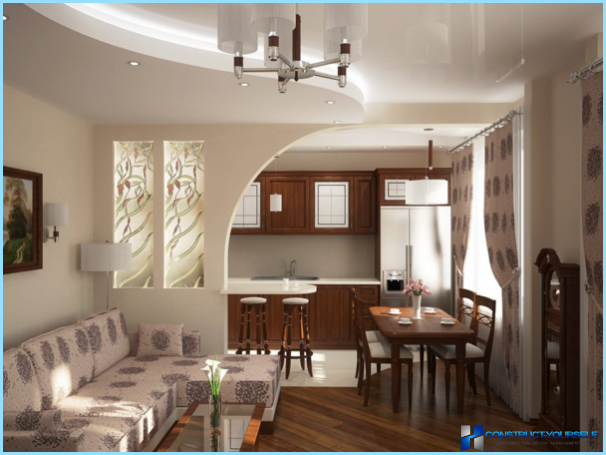 Multilevel ceilings - beautifula way to focus on a certain area combined kitchen and living room. Of course, such work can not conduct yourself each, but after spending some money, you decide a lot of problems: zoniruete room, get a large amount of additional light to make the room a strong design, interesting decor elements. 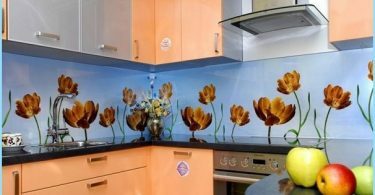 Even the standard kitchen in a small house builtcan turn into the room of your dreams and fantasies. The most important thing - it is not afraid of change, the mind to approach to all alterations, and to respect the basic rules of planning combined living room and kitchen spaces.